I know I promised photos on location, but so far nobody I was travelling with has obliged and I did not have any on my own camera. I was temporarily stymied in uploading the few decent photos I do have by the discovery that I seem to have lost the cable to connect my go-to digital camera to my computer. All together now: AAAAARGHHH! However I have a work around so you will not be completely deprived today, and I promise to share any additional pics I get from my colleagues. Because they are the only ones I have of the completed coat, here are a few photos shot in my indoor "studio location". Ahh, the mink inside. So cozy! It did finally get a "real" workout in the north when the temperatures plummeted to about -30C, with a wind. I'm pleased to report that it came through with flying colours! No wind penetration, except below the bottom button of course. If I had thought to wear my snow pants I would have been entirely toasty warm, if not so elegant. I like how the mink peeks out from behind the outer coat at the front and collar edges. The top button pulls a bit as you can see in the buttoned-up photo. I think I probably sewed it on a bit too high, above the point where the collar starts to curve. However, all things considered I am pleased with how the collar looks, since I had to adapt the pattern to match the front edge and collar of the fur. I took a lot of the flare out of the hem at CB but still, the outer coat is more flared at the hem than the fur. Because the fabric is thin and a little stiff (think a synthetic taffeta) I weighted it by sewing small metal washers into the hem. I thought airport security might be puzzled, but no questions were asked. 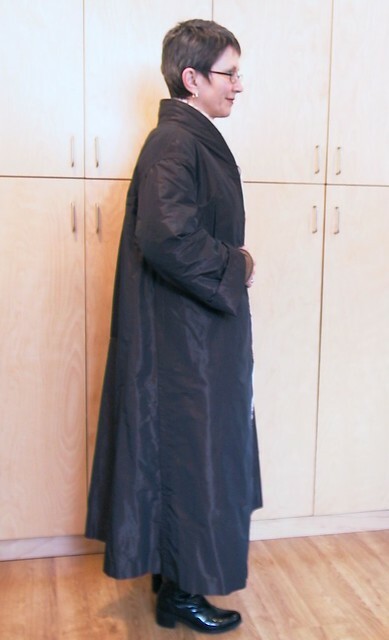 The coat is hemmed a bit longer than Vogue called for. This decision was motivated entirely by the need to control flare. I thought the 3" hem Vogue wanted me to sew would have been unwieldy. To the left is is the best picture showing the edges in more detail. 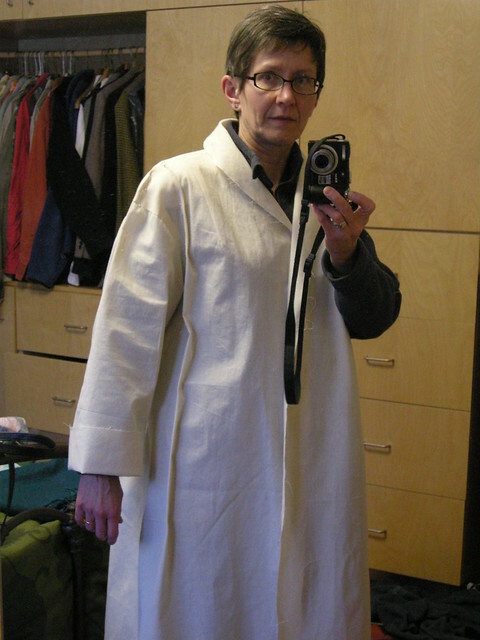 I sewed the outer and inner coats separately, finishing the edges of each. The outer coat facings are topstitched at about 2cm (.75") using heavy duty thread on my Featherweight. 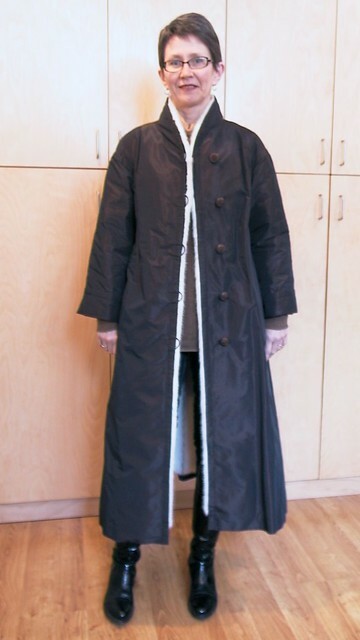 I then hand-sewed the coats together along the front edge. I've already blogged about the construction of the edges on the coat. Here are a couple more pictures. First, to the right is the front edge, showing how the bias strip is hand-tacked to the interfacing/lambswool layer below. At left you can see how the bias strip is attached by zig zag to the lower edge of the coat, and the lambswool strip is in place. To the right, I have folded up the bias strip and mitered the corner in preparation for hand sewing it to the coat. By the way, I used a small glovers needle with ordinary sewing thread to do all hand-sewing on the leather, even though an ordinary needle would have been able to pierce the soft leather. Glovers needles have a triangular tip (think bayonet) that went through this leather very easily. Dark brown fox fur. 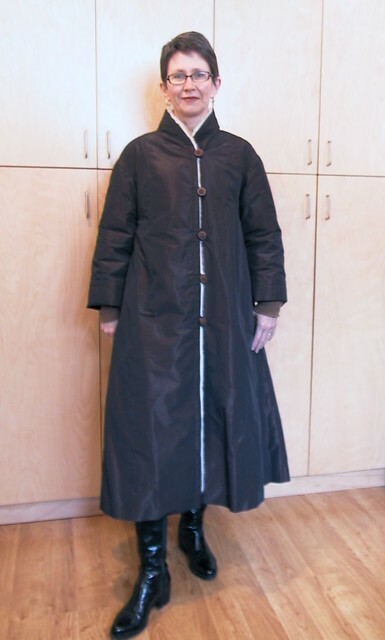 The crown is brown synthetic fabric, so ends up looking quite OK with the coat. It has ear flaps that can be worn up or down. They look kind of silly when down, but fox fur on the cheeks is divinely warm at -30 something with a wind chill. So here's a few shots of the locale. Can you feel the wind chill? Bullock's Bistro. I had the musk ox. The place was hopping! 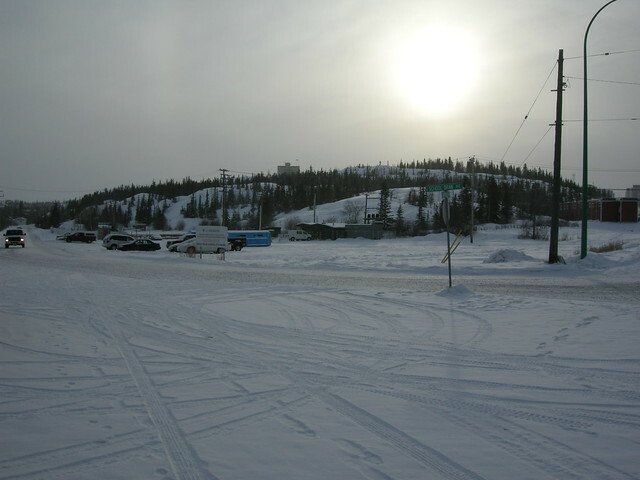 Yellowknife, old and new. 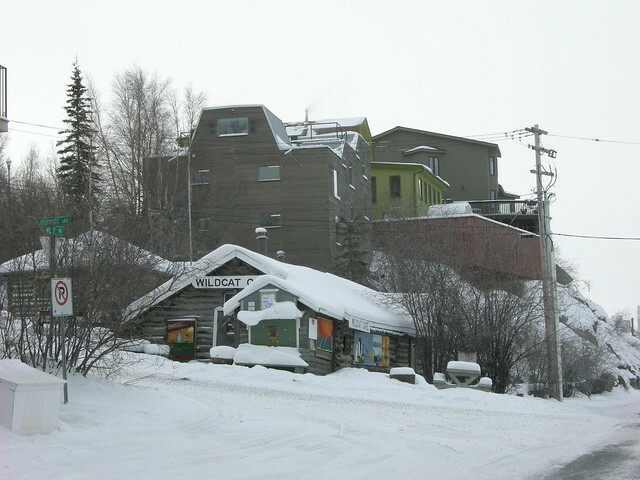 The Wildcat Café was closed for the season. I was the most stylish passenger in this dog sled. Notice how the dogs are all different colours and do not have bushy long fur. 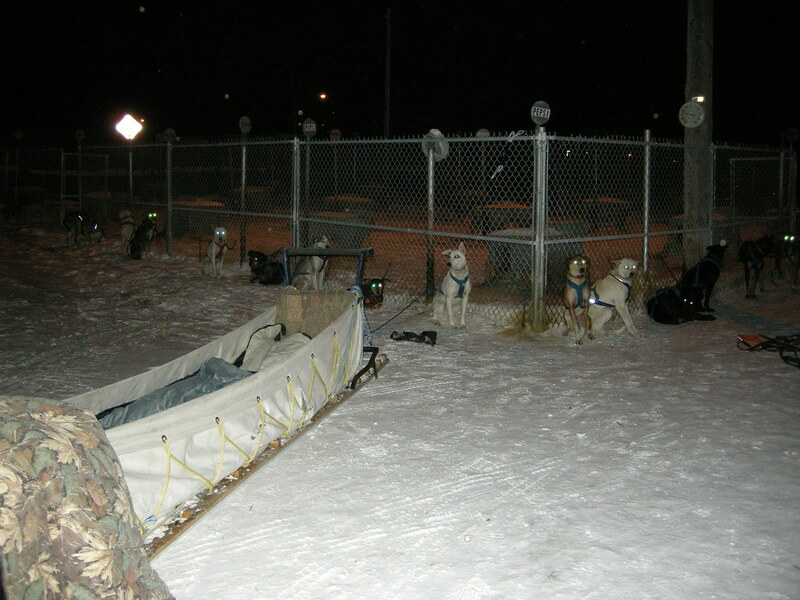 I thought sled dogs would look like the ones in this Wikipedia article. Instead, they are Alaskan Huskies, which apparently originated from the "Native Village dog" i.e. a miscellaneous domesticated canine which happens to live in the far north. And loves to run. These doggies were anxiously waiting to be hitched up (I think 10 of them pulled 4 of us). And the northern lights (Aurora Borealis) were out, and were seen, but not photographed by me (due to inadequate camera + frozen digits). 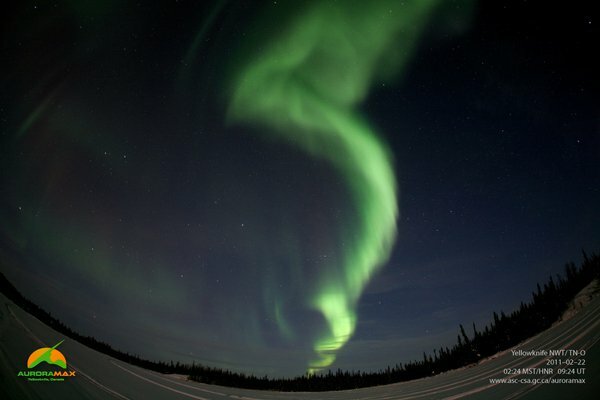 Here's one taken by the pros at AuroraMAX, on one of my two late nights outside in Yellowknife. Now I'm back at home, and looking for a simpler project! This is a post about the adjustment of Vogue 1083. I had to alter the pattern for two reasons. First, for fit, and second, to suit the fact I was lining it with an existing fur coat. Let's look at the fit adjustments first. There are only two reviews of this pattern on PR but they served as a warning to watch out for the shoulders. As they predicted, I found that the sleeve cap has too much ease given that it's a dropped shoulder. 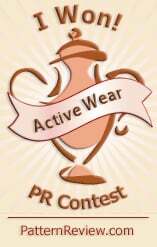 However, the bigger problem is that the shoulder seam is too straight (think T-shirt). The result of these features was an unattractively pointy low shoulder which had to be changed. To fix the shoulder, I curved the shoulder seam downwards about 1cm (3/8") from just beyond my shoulder point to the armscye seam. This took a total of 2cm out of the length of the armscye seam which (along with the too-much-ease) meant that the sleeve pattern needed to be reduced in length even more. To the left is a snap of this modification (which was also made on the back yoke piece). 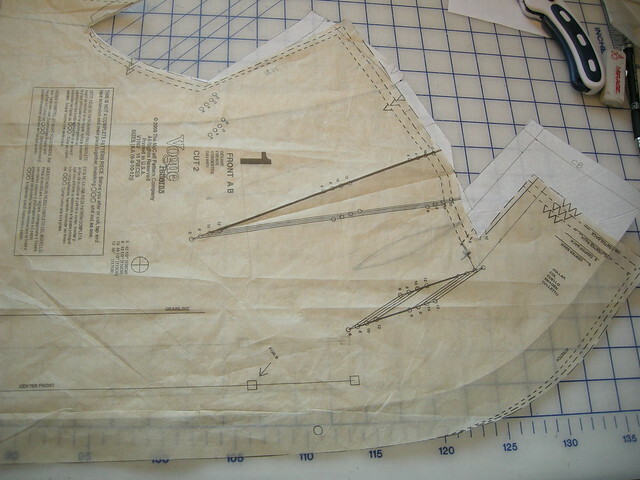 The second main fit alteration needed was to take width out of the front at the shoulder level. My back is evidently wider than my front. I've learned to trust the make-a-muslin-and-pin-out-the-extra-fabric method pictured below. At the shoulder in the photo at right, you can see the pinched-out 2cm along the shoulder seam. Below the shoulder is a more-or-less vertical dart which tapers to nothing at the shoulder, and at its widest is about 3cm (1.25"). This eliminates an unattractive fold that was forming, and which would have made the coat look far too big across the chest. At left, you can see this vertical dart drawn on the pattern tissue. The next step is to slash the pattern along the dart's edge, and literally overlap the tissue so the lines (more or less) line up. You can see, in the photo at right, how I had to slash through the pattern at the armscye to get it to lie flat. 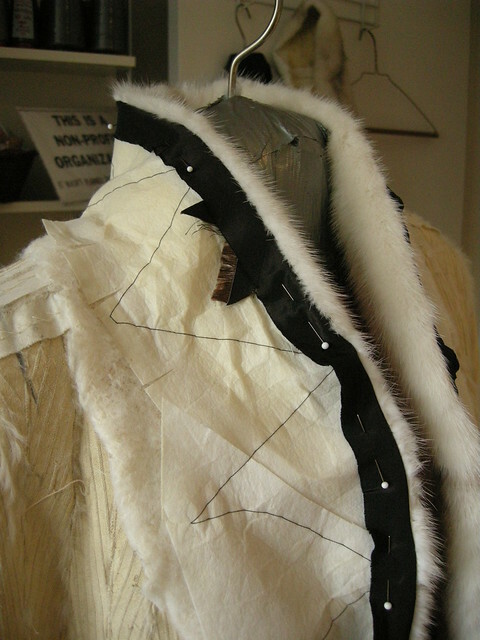 The style adjustments were needed to accommodate the existing line of the collar on the fur coat. 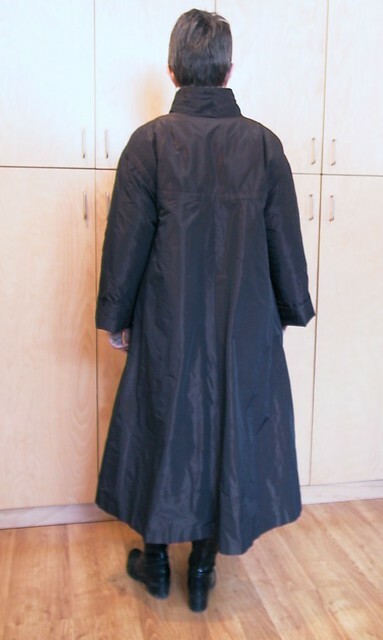 The original coat had a shawl collar. I removed the upper collar which left a curved under collar (CB seam) that transitioned to a straight CF edge. Vogue 1083 also had a curved collar (a shawl) and straight CF edge but they were different shapes. The Vogue pattern's neckline was higher and tighter than Furla's. Also, the curve of the collar was lower and more gradual. Here are some pictures showing how the final pattern pieces differed from Vogue 1083. 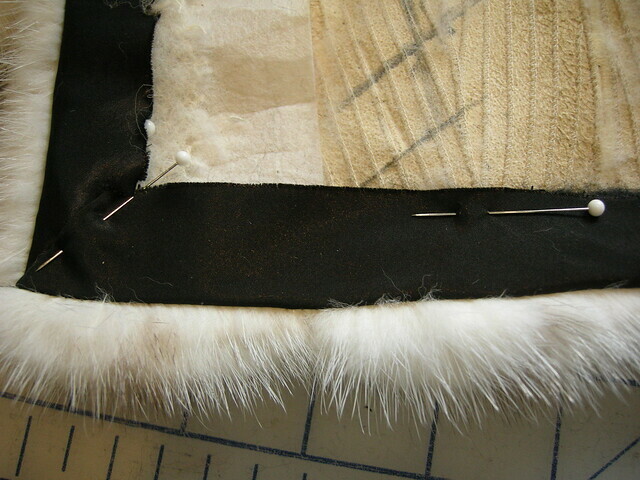 Finally, here's a picture of the taken-apart fur coat, with the adjusted pattern pieces laid out on top. In the end I did not use the pattern pieces to cut the fur. I completely winged it! I'm still lacking for photos of the finished coat on me, but in the meantime I'll share some construction details. Not knowing how a fur coat is built, I paid careful attention when disassembling Furla. It was a big surprise to me to realize how much sewing there was in this coat. First off, the "fabric" of the fur is carefully constructed to maximize its natural beauty. 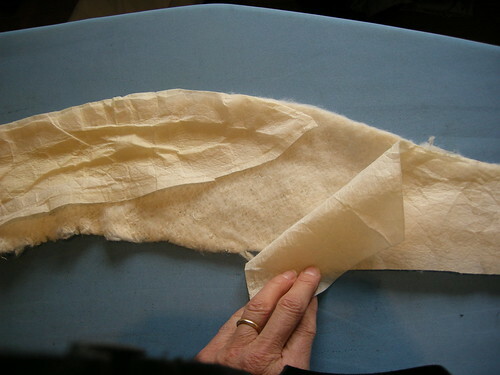 The mink was "let-out" - which means that the raw pelts are sliced into thin strips, apparently diagonally, and the strips are offset and sewn back together so that the original piece is lengthened. Here's a photo of the inside of the upper front of the coat, after I took out the lining and removed the upper collar and front facing. 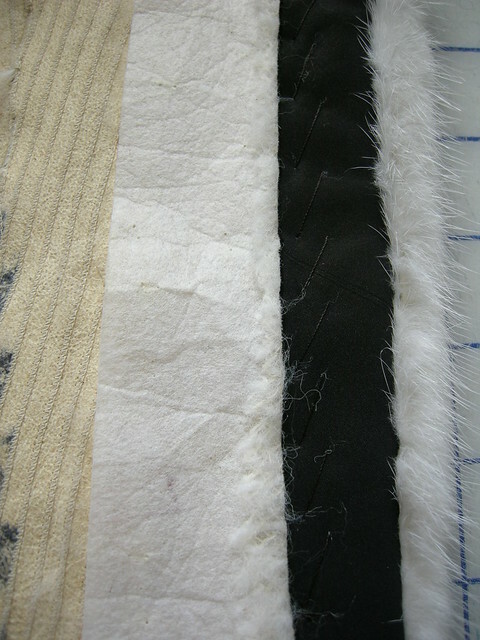 You can see (click the photo to get more detail) the diagonal lines of stitching joining these strips of fur, as well as vertical lines where the lengthened skins are joined to each other. Towards the bottom of the photo you can see little dashes forming connected Vs. These seem to correspond to darker markings on the fur and must have guided the furrier who originally painstakingly transformed the raw pelts into the symmetrical fabric needed for the coat. The sewing is done with very light thread and the seams are extremely flat. There must be miles of thread in the average let-out coat. The construction seams are a little different. They look like a tiny serged seam and create a slight ridge. In the photo you can see the seam joining the under collar to the body of the coat, at the shoulder and joining the front of the sleeve at the armscye. 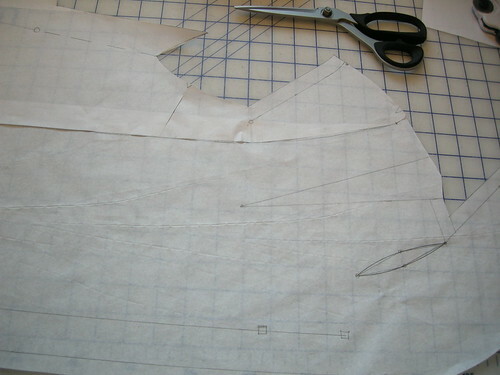 Something vaguely similar can be accomplished on an ordinary zig-zag sewing machine using a universal needle. Set the zig-zag for about 2.5mm in width and the same in length. 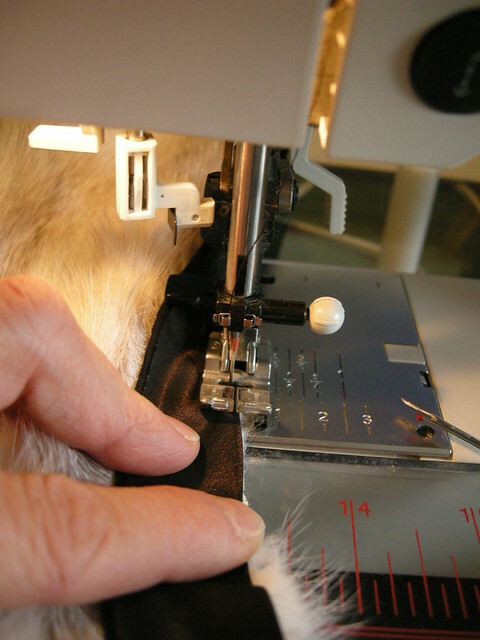 The trick is to align the edges of the skins, fur sides together and sew catching both layers in the left swing of the needle, with the right swing landing to the right of the cut edges for an extremely narrow seam. So, for sewing fur you do not need to allow for a seam allowance. All the while, you have to be pushing/poking all the fur inside and away from the edges to be sewn. I found my seam ripper worked reasonably well for this, but I had to stop very frequently to readjust. If you do catch some of the fur in the seam, it may well not show, and if it does, you can (carefully) pull the hair out of the seam from the right side. Back to Furla. 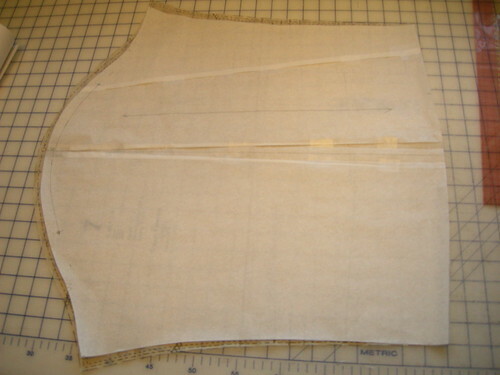 Bias strips of a woven fabric were applied to all edges of the garment pieces in the original coat, as well as horizontally at the waist level. You can see it in the photo above. The tape appears to have been attached with a blind hemming machine or similar - the stitch is a chain stitch and again, very light weight thread is used. I am not sure what function the tape plays. It wouldn't work really well to prevent stretching of the fur, since it is cut on the bias. Second, it's only lightly attached in a single line down the centre of the tape (and sometimes not too neatly). Third, it is inconsistently sewn along with the skins in the seams, so doesn't seem necessary to strengthen the seams. If any furriers read this, please enlighten me - what's it for? The skin of the mink is very soft and thin. 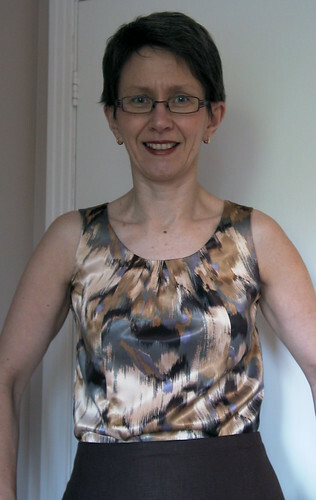 Once I had cut off the original facings and upper collar, the edges were very insubstantial. However, I remade the edges as they were in the original coat. All edges of the fur (i.e. where the lining attached) were finished with a bias strip of lining fabric (a substantial polyester) that was folded in half lengthwise. The folded edge was attached to the fur. I cut 5cm (2") bias strips of the outer coating, which is thin, folded them down the middle, and used a narrow zig zag stitch to attach them. At left you can see an in-progress photo. The seam ripper is just visible on the right - ready to poke those pesky hairs in and out of sight. In addition, all edges (front, collar and hems) were originally padded with folded strips of lambswool interlining. 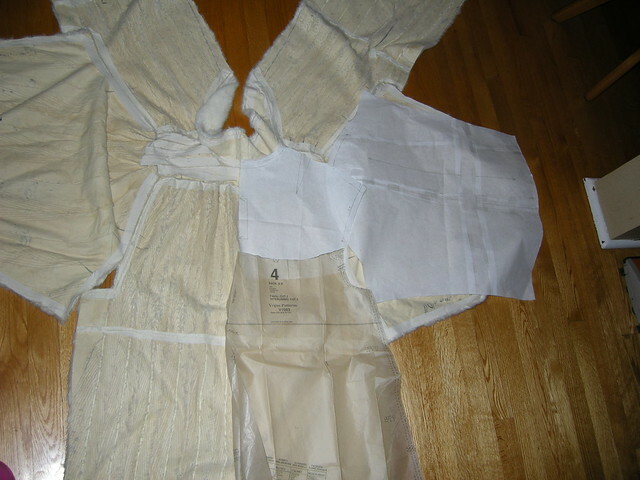 The collar and front edges were also reinforced with fairly rough-cut pieces of sew-in non-woven interfacing. Folding the bias strip over the lambswool produced a firm padded edge, very surprising in comparison with the un-reinforced fur. To the left are the lambswool padding and interfacing removed from the collar of the original coat. I decided to re-use this material. I first pressed the interfacing, and then loosely basted the layers together. To the right is a photo of this padding sandwich, in the process of being reinstalled. You can see that I've pinned the bias edges over it. This causes the fur to roll attractively at the very edge. I was surprised to discover when taking Furla apart that there are little holes all over the coat. Most of these are a byproduct of the sewing needed to let-out the fur. There might be a little point missing or imperfectly sewn at the edge, so the edge of one strip isn't a perfectly straight line. However I also spotted a couple of mistakes, which were roughly repaired with a couple of hand stitches. You would never spot these from the furry side, and the little holes do not impair the warmth of the coat, apparently. 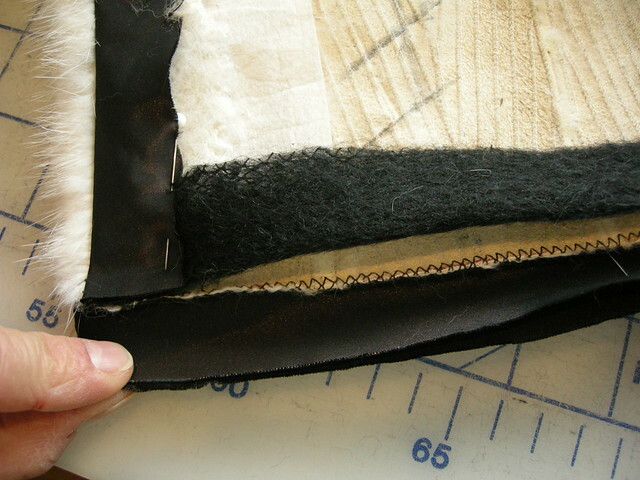 Unlike sewing with leather, sewing with fur conceals a multitude of errors and imperfections! I'm sure I had a clever title for this post, but it seems to have evaporated along with my energy. 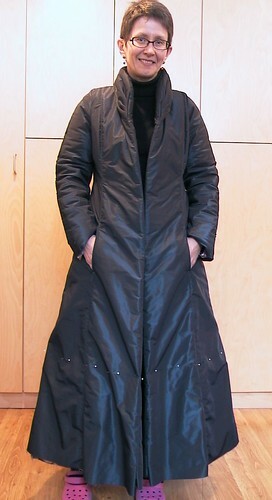 I was gunning to have this coat finished today, and finished it is. However I do not have pictures, yet. You will have to watch this space. I'm jetting off tomorrow morning at an ungodly hour for points north. Yellowknife, Northwest Territories, to be exact. It is 62.3 degrees north, 400 km south of the Arctic circle and about 1,500 km north of Edmonton, Alberta, which at 53 degrees is the furthest north I have been in Canada to date. I have been further north in the entire world, having in 2007 visited Iceland where one day we went to Hafsós which is at 65.9 degrees north, but that was in August. This is February. 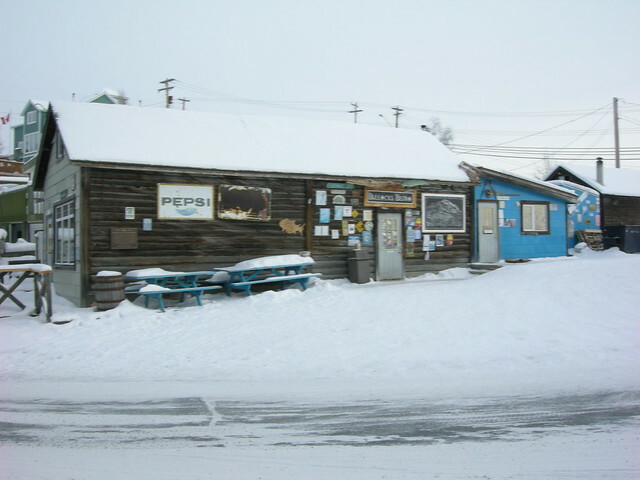 In Yellowknife (unlike Iceland which has an extraordinary and surprisingly moderate climate) it is frigidly cold at this time of year. The forecast is not filling me with abject dread - the coldest is -34 -on Thursday (wind chill -42) but daytime highs will be around -18 or so. This will give my fur-lined coat a good winter workout, without causing me to worry that my life will be at risk. I shall walk out onto the frozen surface of the lake near my hotel where it's dark, to see them better. Wearing fur on the inside. Little hairs will be everywhere, no matter what you do. 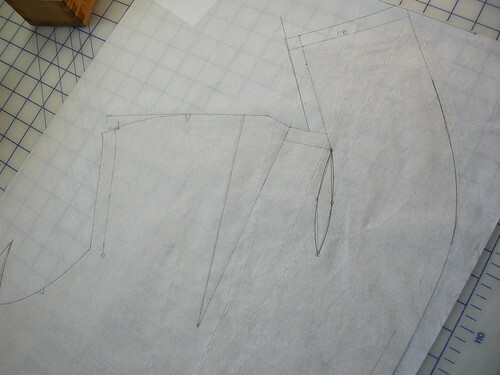 You don't need seam or hem allowances. Mink is very light weight and the leather is extremely soft. However, you can give it incredible oomph with interfacing and lambswool padding. Glovers needles don't differentiate between "leather" and "skin". If you have bad hand-sewing habits, blood will be shed. Ask me how I know. 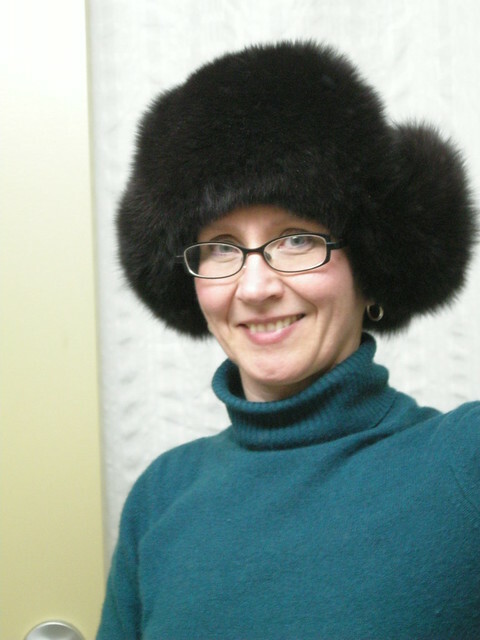 Once I'm in the NWT I'll get someone to take a picture of me in situ, and I'll post more info about sewing a fur coat. The Sewing Lawyer hates UFOs and sewing failures. So she has been stewing over Burda 7731 since January 1, 2010, the date on which she took it off life support, and told you about it. It was so sad. And so frustrating, since there ought to have been a warm, wind and waterproof winter coat in there somewhere. But Burda 7731 languished, unfinished, in the Sewing Lawyer's sewing room, for the last 13 months. It mocked her from its hanger. It loomed over her. And heck, she wanted a coat like that! 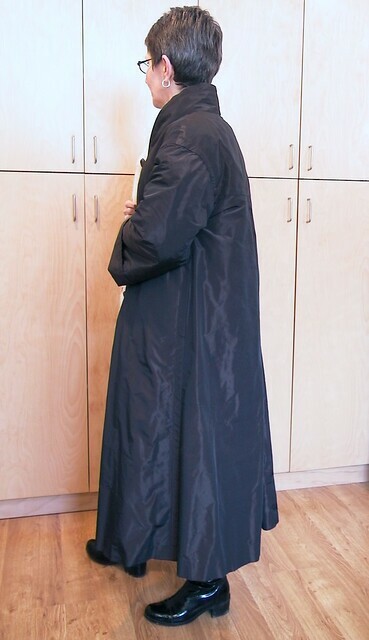 Recently, the Sewing Lawyer was even spotted trying on coats, in stores (!) that were kind of like Burda 7731, except shorter. Really, there was little that remained to be done - just the hems and buttons. So much easier after 34cm were lopped off the bottom (marked with a line of pins in the picture at left). Now, the Sewing Lawyer likes to think that the rumpled and puffy synthetic taffeta looks sporty instead of sad. In the stash were these interesting vintage plastic buttons, and some firm black round elastic. 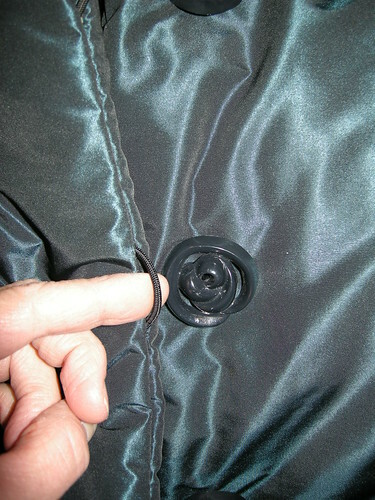 It was a simple matter to poke the elastic through the seam attaching the facings to the coat front. The ends of the elastic were first singed to prevent fraying of the synthetic outer coating, and knotted inside the coat before being stitched into place. 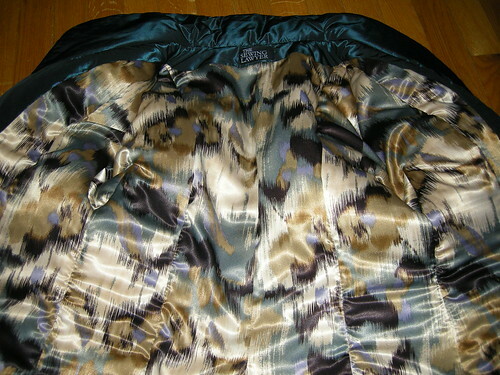 The lining is a poly satin (Fabricland). Quite some time ago (October, 2009 if Flickr is to be believed), the Sewing Lawyer used the scraps left after cutting out the lining pieces for Burda 7731 for a top (left). Truly, this coat has been a long time in the making.